I turned 29 last week and I made a list of 30 things I want to accomplish before I turn 30. (I got this idea from this lady) And then it got lost. In one of those stacks of papers and receipts and stuff that is on top of every single horizontal surface in my entire house….. you have those too right? The Stacks? But here it is. I have already started a few of these. I’ve been working on perfecting my pizza recipe for years. I have never made the same pizza twice because i am always unsatisfied with the results. I really hope that I can finally get #2 down. But I’ve also made my first crochet project (#3). We went on vacation (#28). That was on my list before I knew we were going to California last week, so I am counting it. I hope to get away sometime before 30 with just Scott. We’ll see how that goes. I have a few roadtrip ideas (#22). I am working on #9. Number 20 will make me fat. I better do that one and then undo the damage done before I make that dress (#4). I taped my list up next to the door in my crafty/storage room so I can see it all the time, and I have a copy of it in my phone which I look at a lot as well. I actually have a lot of lists in my phone. I am a total list person. I have lists of menu ideas, new years resolutions, blog ideas, places to go on vacation, thrifty things to look for, sizes of spaces in my house that I am looking for the perfect thing for, a clothes shopping list so I don’t get sidetracked and buy too many things that don’t go with what I already have. You know, lists. Do you make lists of things? I’d be lost without a good list. Also, I would totally download your font. Great list. I never made a list… which is good seeing how I turned thirty LAST YEAR. (I feel old.) But looking at your list there are definitely things there that I want to do. Then again, there is plenty there that would never be on my “list” only because I hate setting myself up for failure. Make a quilt? Sew a dress? My handwriting as a font? Yeah, those would be bad for me. I was going to say what Shannon said too — I like your hand-writing! 🙂 I agree with so many on your list, but I passed 30 almost 3 years ago! Well, it’s never too late to start. I think I’ll do this every year for as long as it is possible. It was so fun to think about what I really want to do for myself. Next years rough draft is already started. I see #28 can now be crossed off the list, that is a great start to finishing the list. Ok, so I turn 30 in June… all my GF’s have already turned 30 and so has my hubby. 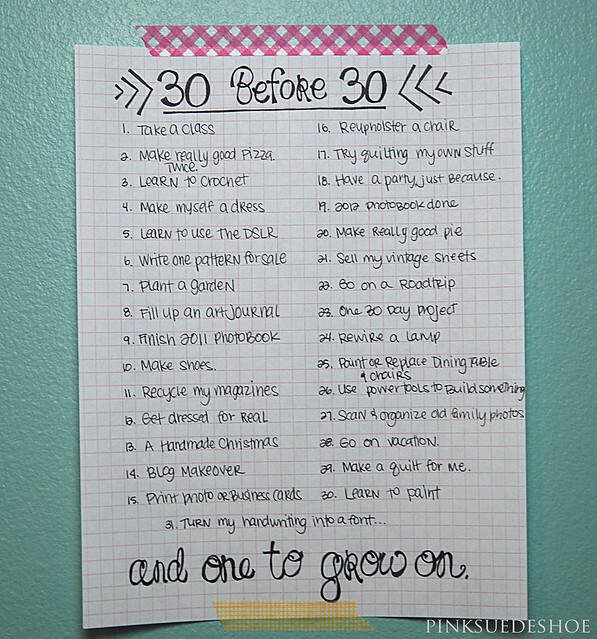 You’ve inspired me to try and do a mini version of your 30 before 30. Thanks for inspiring me!! Hey!! 83 baby! I turned 29 in January – I have a list…. a shorter list of maybe THREE things to complete… but hey, a list is a list, right?! lol! Sounds fun! Enjoy! I love this post. So inspiring. I might do 50 before 50. But that seems like a lot! But I’ve got 2 1/2 years…..
Hmmm . . . You’ve got me thinking: a 40 before 40 list. P.S. if you do turn your handwriting into a font, I’ll totally buy it. 2- When you get to #18, please invite me. 3- I have 13 things on my 40 before 40 list. Awesome list! I am an idea person. But I forget all of them. Therefore, I should be a list person. My husband is a list person. You are a list person. I will learn, promise. Great list! My 30 before 30 list is what inspired me to start blogging and I’ve had a blast marking everything off! Hope you do too!